What Should You Expect from Your Recreational Therapist? Develop and implement a program based on your interests and needs. Evaluate your goals and activities will by revisiting periodically and adjust them based on your progress. As a clinical recreational therapist, where programs will be focused on improving your physical, cognitive, or emotional well being. 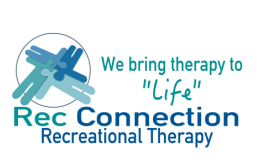 As a recreation leader where you can participate in sessions that provide therapeutic benefits, and keep you active and socially engaged. One of the goals of Recreation Connection is to help people find Flow during their leisure activities. According to Dr.Csikszentmihalyi, when a person is faced with a challenge that is too hard for the skills they have they will get anxiety. On the other hand, if a person is faced with a challenge that is too simple for their skill levels they will get bored. When a person's skill levels meet the challenge perfectly, a person will find themselves in Flow. In flow, one's emotions are not just contained and channeled, but positive, energized, and aligned with the task at hand. The person often feels a sense of "losing sense of time" and "forgetting about everything except the activity at hand". The closer a person is to finding Flow in their activities, the more effective that activity will be.